A new school year | Walk with us! The Dehon Formation Community. 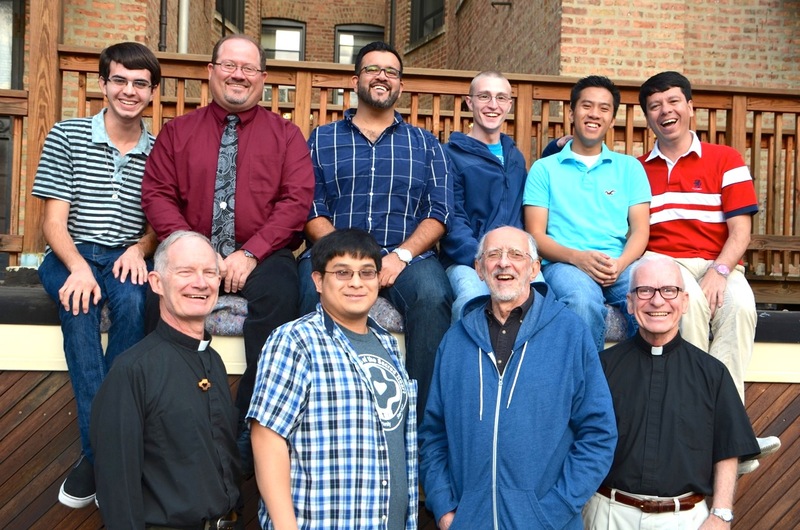 Top row: Gabriel Gutierrez, Br. Duane Lemke, Juan Carlos Castañeda Rojas, Justin Krenke, Anthony Nguyen and Fra. Luis Fernando Orozco Cardona. Bottom: Fr. Tim Gray, Fra. Joseph Vu, Fr. Bob Bossie and Fr. John Czyzynski. Not pictured: Br. Clay Diaz. Joseph Vu, SCJ, from Chicago, has already drawn comparisons with another Joseph: Joe Haselbauer. He is a whiz at math and computers, and can always be counted on to find the solution to almost any problem. Joseph is doing very well in his studies at Catholic Theological Union, but his heart is in his ministry to the youth at St. Henry’s parish on the north side. Every community has “a quiet one” and for us that is “Jimmy” Nguyen, from Seattle, who usually lets his smile do the talking, but who is consistently expected to inspire us with his creative prayers. James loves the quiet and the opportunity to reflect that he finds in the novitiate program. “Juancho”, (Juan Carlos) Casteneda, from Colombia, on the other hand, is constantly at the center of whatever social activity is going on, often in the kitchen , with joyful music at full volume. He also enjoys the novitiate as a break from the grind of studies and an opportunity to know Fr. Dehon better. Fernando Orozco Cordona, SCJ, also from Colombia, like Juancho, misses his family and native land. He has been called “Juan Valdez” for his love of coffee and is always one of the first up in the morning to enjoy his cupful. He enjoyed his summer at Our Lady of Guadalupe in Houston and hopes to return there upon his graduation from CTU next spring. Gabriel Gutierrez, from central California, is the “new kid” of the program, and is still getting adjusted during his first month in Chicago. He is very serious about his studies at St. Xavier, and keeps in touch with the news, especially church news. Br. Clay Diaz, SCJ, from both Massachusetts and Puerto Rico, is in his last year of theology studies and looking forward to final vows. We are awaiting his return from his program in January, when he will return to studies and his ministry of tutoring children at The Port. Br. Duane Lemke, SCJ, our home-grown SCJ from South Dakota, is the local superior and head of the formation team, and is already preparing for Halloween. He puts his creative talents to work in decorating the house, preparing social events, and leading community projects, such as canning fruits and vegetables under the “Sons of Dehon” label. His latest interest is taking a course in mosaics. In addition to all this, he manages to supervise the house and the formation programs. Fr. John Czyzynski, SCJ, from the great metropolis of Cleveland, is the novice master and continues to enjoy his ministry of formation, living in the house, and also his ministries outside the house. He spends a lot of time and energy working with several homeless people in our area, with the goal of helping them live a more settled and secure life. Fr. Bob Bossie, SCJ, thinks he has lost his “Bahston” accent, but we know better. Bob officially retired from his ministry at Eighth Day Center for Justice and now stays closer to home. He still spends a great deal of time and energy caring for his brother, Paul, who suffers from a multitude of health problems. Fr. Antonny Wijaya, SCJ, from the Indonesian province, is studying for a degree in sociology, in preparation for teaching when he returns. Despite the fact that his evening classes make it difficult for him to participate in a lot of community activities, he has been a valued and well-liked member of the house. Mr. Brian Fitzpatrick is a layman, a former seminarian with the Redemptorists, and a former classmate to several of our students, who has lived with us for most of the past year while studying for a degree in social justice. As for me, Fr. Tim Gray, SCJ, I was born in Detroit but considered Houston “home” after 20 years there. Now I am back in Chicago as the newest member of the formation team, and have not yet tired of talking about my travels and exploits in Brazil during my sabbatical. I am working with the professed students in their last years of theology and have located several Hispanic communities with which I will help out with weekend liturgies. I also hope to become involved in immigrant ministry. Our house is at “the crossroads of America”, and hospitality is a major theme. Fortunately, we have several guest rooms, and they are often used. The weekend of October 5-7 was a “come and see” experience. Br. Ray and Br. Long accompanied two prospective candidates, Amir Fahrai and James Bartley, who got a flavor of the formation community. Keep them in your prayers as they discern their call.